From the experience perspective, we argue ‘no’. Indeed, if they were, why would people not be flocking to First Direct in their thousands? Well, First Direct’s customers may love them, but we reckon they rank about 8th from the experience perspective. Brand consideration or customer advocacy are often the default metrics brands use, and some clients have linked these metrics to sales or market share. However, brand consideration rarely moves much, making it difficult to know what decisions to take if brand consideration moves up or down. Always, the question is why? This is where experiences come in. The more experiences someone has with a brand, the more visible and salient the brand appears. Each interaction is an opportunity for brand building. In the absence of experiences (and especially positive experiences), people may deem a brand to be in decline. So, the number of experiences people have with your brand matters. As does how positive these experiences are. So who’s really number 1? Evaluating over 25 retail banks, utilising real-time and survey data from 5,000 people and analysing over 23,000 experiences collected in real-time, we find that Nationwide is the best performing retail bank brand. Nationwide delivered high levels of positivity, making each touchpoint experience count, and is the most considered brand. All this, despite its share of experience being lower than other banks such as (Barclays, Halifax and Lloyds). We found Nationwide stands in a unique position – ‘building society’ – and it reinforces this advantage through experiences from campaigns through to in-branch experiences. Nationwide is best in class on a number of fronts – including owned experiences - and is one of the few players in the market seen as having a reason to exist beyond just making money. Its clever ‘building society’ message lands well. You can see how each brand (with more than 100 experiences) performs on each metric. We take the ranking on all 3 to create an overall ranking (3), with Experience Positivity trumping other metrics where there is a tie. Experiences today are predictive of people’s behaviour tomorrow, so we hope you find this ranking and report future-focused with clear explanations as to why brands are performing as they are today and can see the trajectory they are heading along for tomorrow. In fact, in terms of Share of Experience, Nationwide punched well above its market share, coming in 4th place for share of experience and with positivity of overall brand experience second only to TSB. (As an aside, the period for this report ends March 2018, before TSB’s IT troubles, which dented them for a period, but from which they’ve now recovered). The combination of this plus overall brand consideration puts it top of our experience league table by a clear margin. And we know that Nationwide is winning in terms of share of flow (new accounts and switchers), which reinforces our experience-based marketing point of view. Barclays generated the highest share of experience, partly through sheer market share, and partly through significant and generally well received always-on campaigns. Hot on its heels were Halifax and Lloyds. 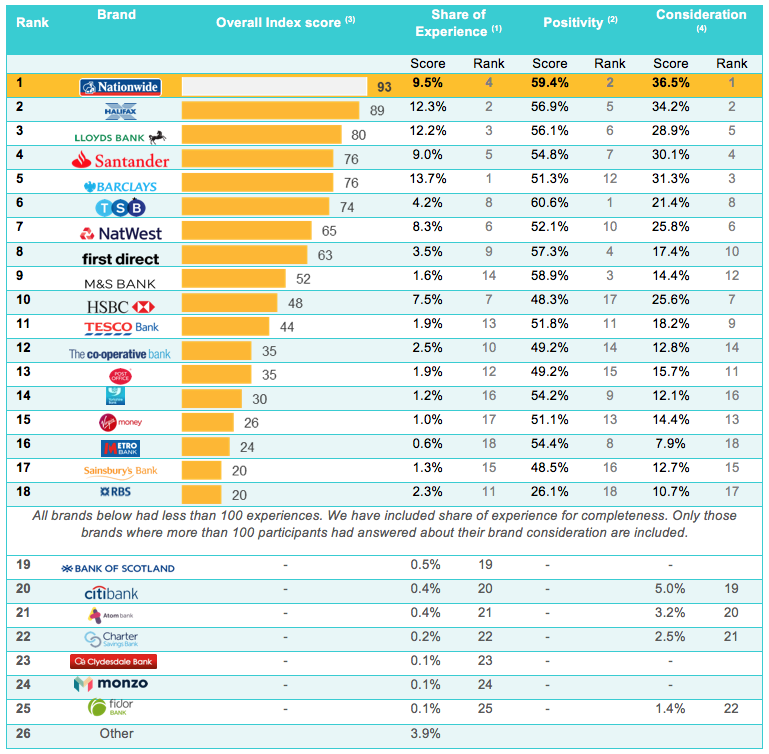 However, Barclays’ performance was marred by negative news and below average experiences in some of their owned and earned channels, meaning that – notwithstanding high levels of brand consideration – Barclays lands at only 5th place in the overall experience league table by virtue of its relatively poor showing for experience positivity. And what of First Direct? They generated a share of experience in line with their market share. Consideration was relatively low: perhaps they are just preaching to the choir. And experiences – whilst positive (a good sign) – were overall inferior to both Nationwide and TSB. The point is that ‘experience’ is not just about customer service. It is about the full range of touchpoints – owned, paid, and earned. Knowing this wider context is what helps brands grow through experience-driven marketing. Sorry, First Direct, but that’s why we think you’re only the 8th best bank in Britain. 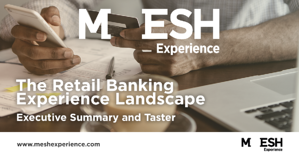 To find out all the detail of why some banks came out ahead of the game, others fell behind, and what’s happening in the market right now, why not talk to us about our Retail Banking Experience Landscape Report?